All of us at Housing4Life believe that EVERYONE should have access to HEALTHCARE WITHOUT RESTRICTIONS, so we incorporated a Healthcare Assistance Program into our Co-Op membership. We call it Healthcare4Life. Our program functions differently than any other healthcare memberships or programs. 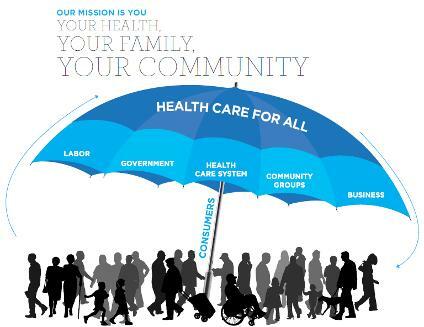 Since our entire Co-Op is based on a "People Helping People" principle, healthcare through our Co-Op membership is paid for by the members for the members. Our program pays for your healthcare needs 100% after your initial visit deposit or insurance co-pay, after any insurance coverage that might be applied. In the case where you DO NOT have an insurance plan, our program pays 100% of your needs based on an accrued amount. Through our Co-Op Membership, healthcare is earned in the form of monetary credit for each member as each member advances through the program, level by level, starting as you complete Level 2 and going on thru Level 7. Healthcare credit accrues on an annual basis as you cycle through the program. The below scale shows how much healthcare credit is accrued in each level. The number of times you cycle through each level in a calendar year depends on one key factor: referral efforts of ALL members. Unless you're willing to tell others about this awesome program, you may not accrue a lot of healthcare credit. The solution to that problem is getting out of your comfort zone and spreading the word, helping the program to spread. Our program uses the credit accrued by each member to pay their unpaid medical bills. When you visit the doctor, whether you have insurance or not, there's still a minimum your doctor will ask for to help cover the cost of the visit, either a deposit or co-pay. The portion of your visit paid for by our Co-Op is the bill received from the doctor's office for what you owe, or the amount of the bill that wasn't covered by your insurance. Simply scan a copy of the bill, email it to our support group, and we send a check to your doctor for you. Your Bill IS Paid!! Though we are NOT an insurance product, rather a co-op membership, there are certain types of care we will pay for, and a few other service we will cover by paying it forward. ANY Medical, Dental, Vision, Chiropractic, Holistic, and Veterinary care will be paid by the Co-Op. Additionally, due to it's relation to medical care, our program will pay for adoption services for young, un-wed pregnant mothers that aren't ready to be mothers. Abortion of a child is NOT care, and causes complications for the mother. So, we will pay for adoption services for the mother to avoid such practices. Whatever portion of the credit that is not used by the member at the end of a calendar year, 25% is returned to the member in the form of cash, 25% kept by the program for sustainability and other support projects, and the remaining 50% held into your account to start the following year.